The San Antonio Spurs are a win away from the Conference Finals as the defeated the Los Angeles Clippers 96-86 in game three to take a 3-0 series lead. Down 40-16, the San Antonio came roaring back on the heels of a 24-0 this quarter run to push the Clippers to the brink of elimination. Tony Parker led the Spurs with 23 points and 10 assists. Tim Duncan had another good game with 19 points and 13 rebounds. Blake Griffin had his best game of the series with 28 points and 16 rebounds. Chris Paul added 13 points and 11 assists in the loss. There will be no rest, as the Spurs will look to close things out tonight on game 4 from Staples. Much like game 2, the Oklahoma City Thunder used a fourth quarter rally to defeat the Los Angeles Lakers in game four 103-100. For much of the second half the Thunder seemingly could not break 7-point barrier. Russell Westbrook kept grinding away, and then Kevin Durant took over late to seize victory from the jaws of defeat. First, Durant nailed a 7-foot jumper over Kobe Bryant to tie the game at 96. Then with the game knotted at 98, Durant stole a weak pass from Pau Gasol and took the ball down the court. Without calling a timeout, Durant let the clock run down and then nailed a 26-foot three-pointer from the top of the key to put the Thunder up 101-98 with 13.7 seconds left. Kobe Bryant missed a three on the Lakers next possession and the Thunder would go on to win 103-100. 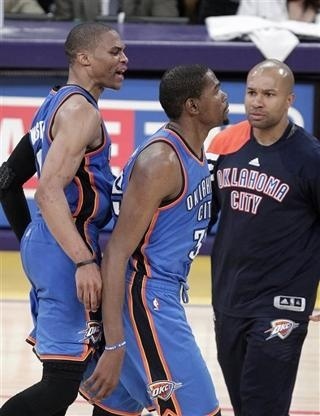 Westbrook had a game high 37 points, and Durant had 31 points and 13 rebounds. Kobe Bryant had 38 points in the loss. 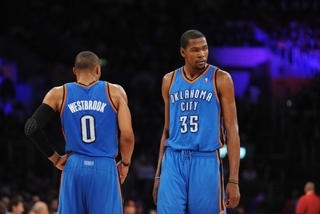 The Thunder will look the close things out in game 5 monday night as the series returns to Oklahoma City. The Western Conference finals is going to be great. The Spurs and Thunder are playing great basketball right now…I can’t wait to watch it!